The 24th annual Communicator Awards honors mStoner clients with three Awards of Excellence and three Awards of Distinction. With thousands of entries received from across the United States and around the world, the Communicator Awards is one of the largest and most competitive awards programs honoring creative excellence by communications professionals. 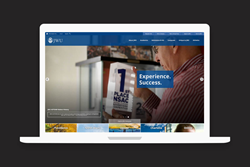 Wheaton College and Johnson & Wales University both received top marks and the highest honor, the Communicator Award of Excellence, in their respective education and university categories. Wheaton received an additional Award of Excellence for Aesthetic Visual Appeal. Three Communicator Awards of Distinction were given to Colburn School, Mills College, and St. John Fisher College in the School/University category. mStoner, Inc. is a digital-first creative agency. We craft powerful, tailored, human-centric experiences to illuminate your brand and allow you to tell the story only you can tell. We connect you with the right audience at the right time so you can form right-fit relationships. We position your team for improved productivity, sustainable growth, internal alignment, and proof-positive success. And we aim to make your job fun again and help you create inspired work that you are proud to show off. Since 2001, we’ve worked with more than 350 colleges, universities, and professional schools in the U.S. and abroad. For much more, visit our website at mStoner.com.